Roald Dahl Funny Prize Judge lineup announced! On Roald Dahl day, yesterday, it was announced that a new member has joined the judging panel for the Roald Dahl Funny Prize! John Kearns, the newest member to the panel, was winner of the Best Newcomer award at the Edinburgh Comedy Awards this year and joins an impressive list of authors and illustrators, including last years winner Jamie Thomson. The prize ‘aims to promote laughter and humour as a feel-good factor when reading,’ is partnered with the Booktrust and supported by libraries, teachers and parents. The shortlist will be announced 24th October with the winner of each category, age six and under and age seven to fourteen, revealed on December 10th. For more info visit the booktrust website. Egmont have acquired the rights to Grasshopper Jungle and a second book by US Author Andrew Smith. The book will be Andrew Smith’s UK Debut and is already gaining a lot of attention with fantastic quotes from Michael Grant and great excitement in the Egmont offices. Grasshopper Jungle has been described as a genre-bending coming-of-age story which happens to be the funniest book ever written so I am very excited about it. It will be published in February 2014 at the same time as Dutton in the US and Hardie Grant Egmont in Australia. You can find out more about the book on Goodreads and Andrew Smiths website. Unfortunately I havent got round to reading my copy of David Levithan’s newest book, Every Day yet but I do love this trailer by the awesome guys over at Egmont! 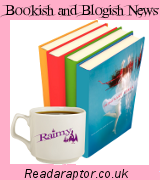 For more info about Every Day visit the goodreads page, Egmont’s website or David Levithan’s Website. Black Milk Clothing Launch Harry Potter Line. Ok, So I am not usually one for talking about clothes… but come on, these are HARRY POTTER themed clothes! I absolutely love the new clothing line that the guys at Black Milk have launched and am desperately seeking a Hufflepuff Shooter top (see what I did there?) Head on over to their blog to see some behind the scenes pics from the photo shoot and to the website to see the launch in its full glory! I’m sure you have all heard considering it made national news but can I just direct anyone who doesn’t know to Ms Rowling’s website where there is a statement about her Screenwriting debut which will be coming soon in collaboration with Warner Bros, in the form of Fantastic Beasts and Where to Find Them.